We are back home today. Smartest move I ever made? Taking the day off. I knew we’d want a chance to recuperate. What I did not expect was for the city to shut down thanks to a surprise snow and ice storm yesterday – one that made the long drive back both beautiful and treacherous. We left Boise about 8 AM, figuring we’d have a leisurely, uneventful 7-hour drive back home. Shortly after, we got a message from my mom. She said it was snowing back home. This was unexpected, but I figured it wouldn’t be a big deal. Probably just a few flakes that would melt as soon as they fell. I was wrong. Portland/Vancouver ended up with 1-2″ of snow – not a lot by most standards, but remember, this is the Pacific Northwest. We’re wimps out here. It was enough to wreak havoc on the city. The weather on our drive grew progressively worse as the afternoon wore on. The Blue Mountains were icy, and we started seeing a lot of wrecked cars on the side of the road. We made it over the mountains – whew! – but Interstate 84 was no better in the flatlands. 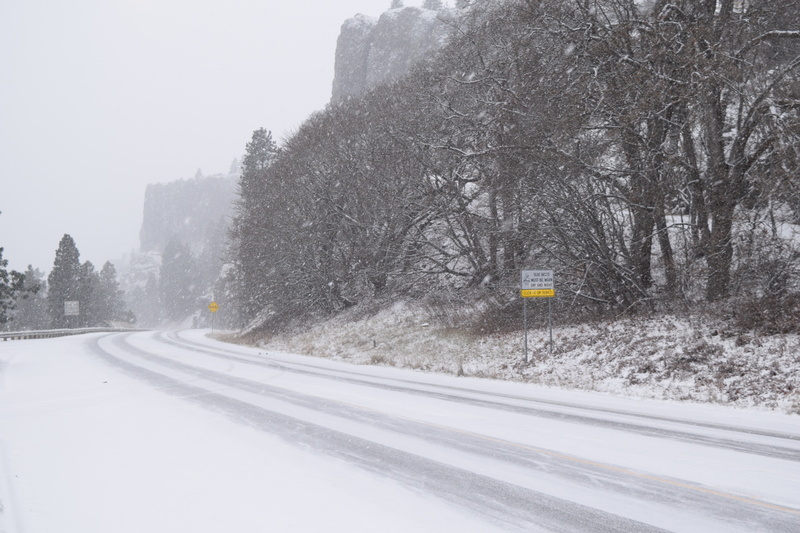 In fact, that too was really slick, especially as we neared the Columbia Gorge. Cars were spinning out left and right, and we were crawling along at 40 mph. Our traffic app showed lots of wrecks and a very slow drive, so we decided to take a chance and cross the river to the Washington side at Maryhill. This turned out to be a great idea; State Route 14 is a winding two-lane road, but there were very few cars and it wasn’t nearly as icy as the interstate had been. Soon, it started snowing; before long, it was coming down fast and furious. 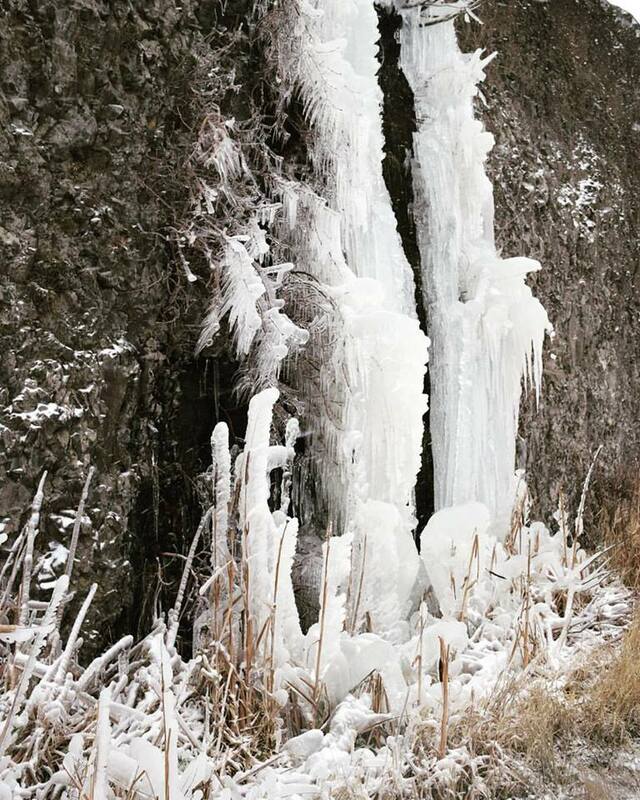 We saw lots of frozen waterfalls along the side of the road. Half an hour from home, the snow turned to sleet, and then to freezing rain. That really made things slick! We finally made it home around 5 PM, about two hours later than expected, after stopping to grab a pizza and a few items from the grocery store. I figured once we left Ely we wouldn’t be seeing any more snow, but…surprise! There was actually snow on the ground the entire way from Ely to Portland. 840 miles of a pristine winter wonderland. Love it! We are going to remember this drive home for a long time to come. Our trip was short, but a lot of fun. We celebrated Tara’s grandparents’ 60th anniversary on Friday with an open house. People were stopping by all day long, and we had quite the spread: roast turkey and ham, deviled eggs, black eyed peas, smoked trout, chicken wings, and a variety of dips and salads. I even got in on the action and made guacamole. By mid-afternoon I was feeling cooped up and decided to go for a walk, but I forgot just how cold a windchill of 0 is. Halfway through my ears were throbbing in pain and I started to worry about frostbite. As in, genuinely, paranoid-my-ears-were-going-to-freeze-and-fall-off, worry. So I booked it back home to thaw out. Saturday we met up with friends for breakfast downtown before taking a drive out to the coke ovens about twenty minutes east of Ely. If there is such a thing as a “tourist attraction” in this tiny Nevada town, the coke ovens are It. Originally we’d planned on staying until Sunday, but decided to leave a day early so we could break up the long 13-hour drive into two days. We hit the road about 2:30, stopping in Twin Falls for dinner at Chili’s, and then pushed on to Boise, where we spent the night. Followed, of course, by our crazy drive home. So today, we’ve got nothing planned beyond kicking our feet up and relaxing. It’ll be back to work tomorrow. But, hey – at least it’s a short week! Here are a few more pics from our trip. Feel free to click and enlarge so you can FILL UP YOUR SCREEN WITH PHOTOGRAPHIC GOODNESS!!! Really neat shots of the waterfalls. We are wimps out this way too. 1-2 inches closes the city for a week. Oh and I must have angered the weather gods with my comment about your snow the other day as we went from 70s to flurries in less than 48 hours. I take it the colder weather is not something you were looking forward to? I was looking forward to sweaters, but not snow days. I had enough of those last winter. Mark, you were very wise to take the extra off to recoup because I do the same thing whenever I take a trip away from home. I need that extra day to get my bearings before heading back to work. GREAT photographs! I especially love the ones of the frozen waterfall and the coke ovens!! Oh, and you’ll be happy to hear that it did suddenly get extremely cold here over the past two days. In fact, I had off today so I got up very early and took a long walk up to U of Penn and spent the whole day there. I took a ton of pictures. It was so cold (and windy) that it felt as if the skin on my face was going to freeze off. But OMG…did I ever have a great time. FINALLY…it feels like winter!!!! Better late than never, Ron! I foresee a “cold day in Philly” photo-heavy blog post in your future. At least, I hope there is. You inspire me to take better pictures, and to brave the elements in order to get those “perfect” shots. Um, ugly is more like it! I’ve had enough of those stressful drives to last me a lifetime. But 1-2 inches? We call that a dusting! So I take it that there’s no such thing as salt trucks or snow plows there? That’s awesome that Tara has grandparents and that they’ve made it to that milestone! But now I feel old as my parents have been married 54 years. No salt trucks out here. That stuff is bad for the environment and hurts the salmon! So we use sand and gravel instead. As a result, windshield repair companies make a killing every time it snows. There are a few snowplows, too. And those were out in full force during the storm. Kitty litter works, too! Our town actually uses an Eco-friendly brine first, which supposedly reduces the use of salt. I really don’t care, as long as it works. Yeah, I remember the NW and snow. Terrible. But if you really want to see funny, come to Dallas in a snow / Ice storm. If the weather person even mentions Snow the entire city shuts down and the grocery stores are cleaned out. It is actually pretty funny.